Thriller On The Ice: Blackhawks Beat Bruins In Triple OT : The Two-Way Game 1 of the NHL's Stanley Cup Finals lasted nearly twice as long as a regular game. It ended in the third overtime period when the puck deflected off one of the Blackhawks and into the goal. The thrill of victory; the agony of defeat: Andrew Shaw of the Chicago Blackhawks (right) celebrates after the game-winning goal goes in. Boston Bruins goaltender Tuukka Rask looks back toward the puck that's now in his net. Hockey fans got nearly twice their money's worth Wednesday night as it took until deep into the third overtime period for the hometown Chicago Blackhawks to defeat the visiting Boston Bruins in Game 1 of the Stanley Cup Finals. Chicago came back from being behind 3-1 in the third period to tie the game in regulation and then win by a score of 4-3. 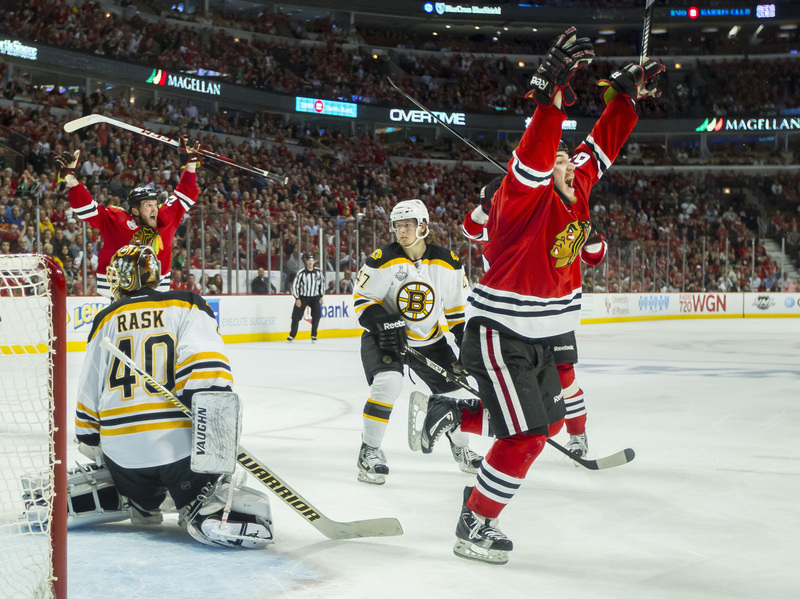 Forward Andrew Shaw was credited with the decisive goal at the 12:08 mark in the third OT. The puck went in after a "double deflection." Translation: Blackhawks defenseman Michal Rozsival shot the puck toward the net, it hit teammate Dave Bolland and then bounced off Shaw's leg and into the goal. -- A player can't use a "distinct kicking motion to propel the puck into the net." But "a puck that deflects into the net off an attacking player's skate who does not use a distinct kicking motion is a legitimate goal." -- NHL games have three, 20-minute-long regular periods. In the playoffs, overtime periods also last up to 20 minutes. The first team to score during overtime wins. So the Hawks and Bruins played 60 minutes of "regulation time" and another 52 minutes of OT. How the game's being portrayed depends on where you live, of course. The Chicago Tribune calls it a "Game 1 epic." The Boston Globe says it was a "heartbreaking" loss for the Bruins. Want to see the goals? The NHL has put together video highlights here. Game 2 is Saturday at 8 p.m. ET. NBC-TV is the broadcaster. Korva previewed the playoffs for us on Wednesday.